The hotel was renovated in 2010 by its new management. It now offers for your enjoyment a new Coffee House full of homemade food and a range of teas and coffee. Also the Vickers Music and Party Bar, for live bands and celebrations. There is free WIFI available, and when the sun shines, you can watch the world go by outside on our decking area.. 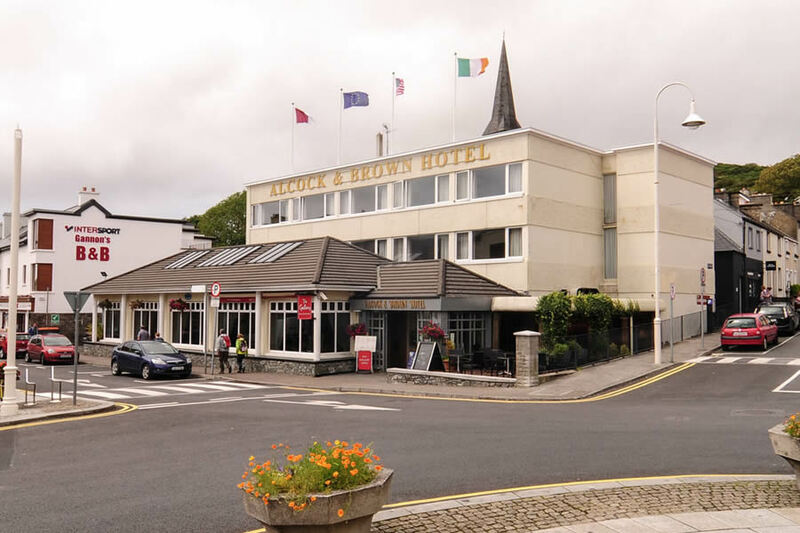 The Alcock & Brown, is located on the Town Square in Clifden, Connemara's Capital. As you may, or may not have guessed, the hotel derives its name from the historical event which took place on the morning of 15th June 1919, when Capt. John Alcock and Lt. Arthur Brown guided their Vickers-Vimy biplane through the early morning sky to a bumpy landing in the bogs just south of Clifden. We had a very enjoyable stay in the Alcock & Brown Hotel Clifden. The staff were lovely and we really felt welcome and there was a definite personal touch to our stay. The food was excellent and we would have no hesitation in returning and I would definitely recommend it to family and friends. We hope to return there before the end of the year. Regards, Catherine Hurney and friends. Our stay at the Alcock and Brown was delightful. It coincided with the local arts festival and some of the best September weather experienced in recent years. So it was win win win. Staff were very friendly and helpful.The accomodation was of a high standard and we thoroughly enjoyed our stay. Regards, Gai Hardy. Staff very friendly and helpful,Hotel clean and cosy would stay again, enjoyed couple of days there. lovely hotel in town centre, friendly staff & great food. I will be back! Stayed for 3 nights on 28th March 2012. Hotel has a great central location in Clifden. Room was spotlessly clean, staff were very helpful and friendly and food was top class, really enjoyed the breakfasts and evening meal in the restaurant was superb! Would definitely come back. Derek. There was a bit of a musty smell when we walked into the reception. However, the bedroom was fresh, clean and had everything you wanted. All staff were very friendly. The restaurant at night had a limited menu, but were really enjoyed the food. The breakfast was also cooked well. The tv could have been a little bigger. The hotel was in the centre of town and everything was within easy walking distance. We enjoyed our time at this hotel. We spent two nights in this hotel. It is under renovation with the first floor completed. There were a number of menus available to choose from depending of value choice. The food was good within the choice given and considering the time of year and the number of people in the area. The staff were very friendly and any request was no problem. The owners, Sharon and Declan made themselves known to us and paid particular attention to our comforts. Paula, was very interactive with us as we discovered we had visited other areas where she had worked. The hotel was very peaceful with plenty of oportunity to read. We really enjoyed our stay here and would have no hesitation in recomending this hotel to anyone and we look forward to coming back at some future time.